Ambient DJ Service: Book Review "If your website was an employee would you fire it?" Book Review "If your website was an employee would you fire it?" At last month's meeting of the New Jersey Disc Jockey Network (NJDJN), I had the pleasure of hearing Alan Berg give a presentation about providing great customer service in the wedding industry. Afterwards I purchased a copy of Alan's recent book "If your website was an employee would you fire it? 5 things you wish you knew before you made your website... and how to fix them." For those of you unfamiliar with Alan Berg, he is a highly-regarded sales and marketing consultant specializing in the small business space, and the wedding industry in particular. A great consultant makes you think. In any profession, there is a tendency to get bogged down in daily operations and to lose sight of the forest for the trees. Berg's book, at a concise 128 pages, is like a powerful dose of smelling salts, to get a business owner re-focused on what makes an effective website. 1) Who is Your Site's Audience? 2) How Will You Get People to Your Website? 3) What Do Your Customers Want to See and Do on Your Website? 5) How Often Will They, or Should They, Return to Your Site? A website should speak directly to its target audience. To do this, a business owner should define a detailed customer "persona" or perhaps multiple personas if servicing different segments. When multiple personas prevail, you should market to each segment separately and consider using landing pages (or separate websites) to get the visitor to the most relevant content. In other words, avoid trying to be all things to all people. Give your Site Visitors Something to Aspire to. Berg writes that "Most advertising is aspirational: It makes us aspire to be like the people we see in the ads who are using a particular product or brand." This discussion was thought-provoking and really got me thinking about what specific images should be incorporated into our website. Who is the "typical" Ambient DJ bride? Berg also addresses the question about whether a business owner should include photos of him or herself on a website, and the answer may surprise you! In evaluating prospective advertising programs, revenue per click is a far more relevant metric than cost per click. As Berg reminds us "Advertising is not about costs; it's about the return on your investment." High profile/cost advertising programs are not necessarily bad, nor are inexpensive advertising programs necessarily good. Talk To Your Audience About Them, Not About You. Disc jockeys in particular love to talk about themselves! Berg once again pulls out the smelling salts and reminds us that the website is about them (the customer) and not about you (the service provider!). Does the copy on your website follow this common sense principle? Incorporate More Calls to Action. Each page on your website should have a call to action. This can be done with variety and in good taste. These calls to action can increase the probability that a customer will contact you and not leave your site (to a competitor's). Overall, we would highly recommend this book to any small business owner looking to run a diagnostic test on their existing website. From our perspective, it was a timely read as our company is poised to launch www.ambientdj.com (version 3.0) later this month. There are many actionable ideas from the book that we are planning to incorporate. If we gain just one additional client from these ideas, then we will have earned a stratospheric ROI from this book purchase! 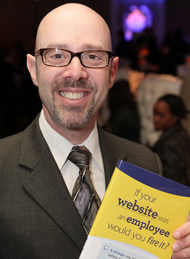 For those of you interested in purchasing a copy (also available in digital version for Kindle), you can visit www.AlanBerg.com. Like your post. It is very interesting. It opens up interesting ideas and concept, something that requires deep pondering. Thanks for sharing such a interesting blog. More power to you! The Best Music of 2011 - The "Ambies"